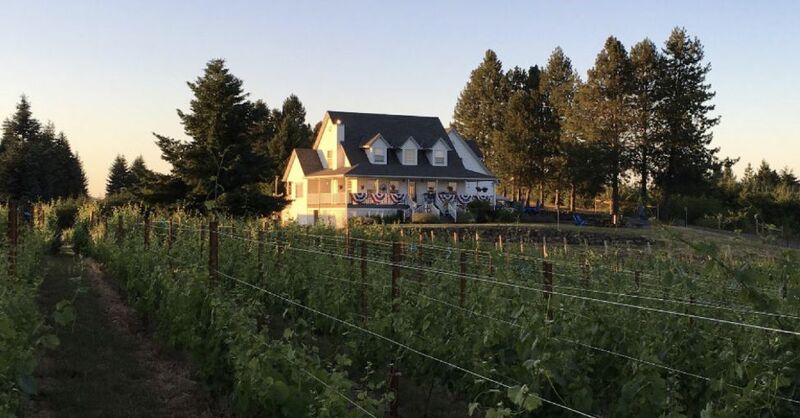 This smallish family-owned winery is not located among the popular and well-known Northern Willamette Valley wineries. Rather, it can be found in the Southern Willamette Valley in the town of Philomath. 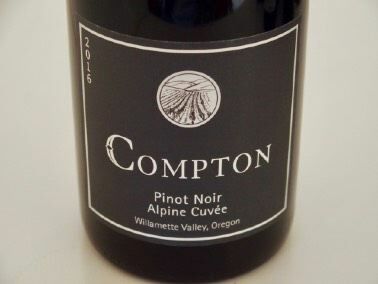 Founded by Matt and Tabitha Compton in 2003, the winery produces multiple varietals under the Spindrift label and Pinot Noir under the Compton Family Wines label. Matt has been crafting wine in Oregon for over 20 years but is also a grower who owns West Vine Farms, a vineyard management company, and manages most of the vineyards from which Spindrift Cellars sources fruit. Growing up in Wisconsin, Matt caught the farming bug and was driving a tractor and baling hay at the age of 10. After studying horticulture in college on the East Coast for a year, he took a trip around the country. He visited a friend who was attending graduate school at Oregon State University (OSU) in Corvallis and when Matt saw the campus and the town of Corvallis, he was hooked. He moved out to Oregon from the East Coast lacking a job. Matt enrolled at OSU and started working for researchers at the school. Matt made his first wine as a home winemaker in 1996 while working at OSU’s experimental Woodhall Vineyard outside Alpine. He developed a reputation as a talented farmer, and in 2000, he launched his own company called West Vine Farms initiated with a management agreement for Deerhaven Vineyard (he still manages the vineyard today). Matt became the vineyard manager at Benton Lane Winery as well as managing other vineyards. In 2003, he made his first commercial vintage at 720 cellars, hoping to build a winery business. In 2004, Matt and Tabitha founded Small World Wine Company with partners Jeff and Diane Cyan. At the same time, the two couples started a wine bar in Corvallis. In 2006, Matt left Benton Lane Winery and together with wife Tabitha started Spindrift Cellars. Domaine Meriwether produced wine at their facility and Matt got to know their winemaker, Ray Walsh, who became an important mentor. 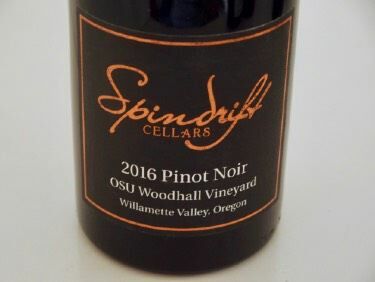 The winery produced 1,000 cases of wine during the first Spindrift Cellars harvest and have steadily increased output, making 8,000 cases of wine from more than ten different varietals in 2015. Today, Matt’s heart is in Pinot Noir and he plans to scale back the number of varietals that Spindrift Cellars offers. West Vine Farms now only manages the vineyards from which Matt gets fruit for his Spindrift wines. Tabitha manages the day-to-day operation of the winery including sales, advertising, and marketing as well as having the hardest job - raising three boys. Other members of the extended family are also involved. Matt Compton’s personal label is Compton Family Wines. These wines are reflective of special vineyards that Matt has overseen and managed through the years. A premium sparkling wine is offered under the SEA 02 brand and recently won a Gold Medal at the San Francisco Chronicle Wine Competition. The winery’s tasting room is located at the winery in Philomath and is open Friday-Sunday afternoons during winter, Thursday-Sunday afternoons during summer, or by appointment. The wines are sold on the website at www.spindriftcellars.com and www.comptonwines.com. I am featuring this winery for a couple of reasons. I was impressed with the 2015 vintage wines submitted for review in the past and even more impressed with the 2016 vintage wines currently reviewed. These wines have the handprint of an experienced grower and winemaker. The wines also represent extremely good value, especially since I consider them equal in quality to any wines currently being produced in the Northern Willamette Valley. The vineyard sources for these wines are from the Southern Willamette Valley. The soils here are shallow, well-drained volcanic basalt combined with marine sedimentary rock and/or alluvial deposits. The two Compton Pinot Noir cuvées show the difference in Pinot Noir grown in these two different soil types. 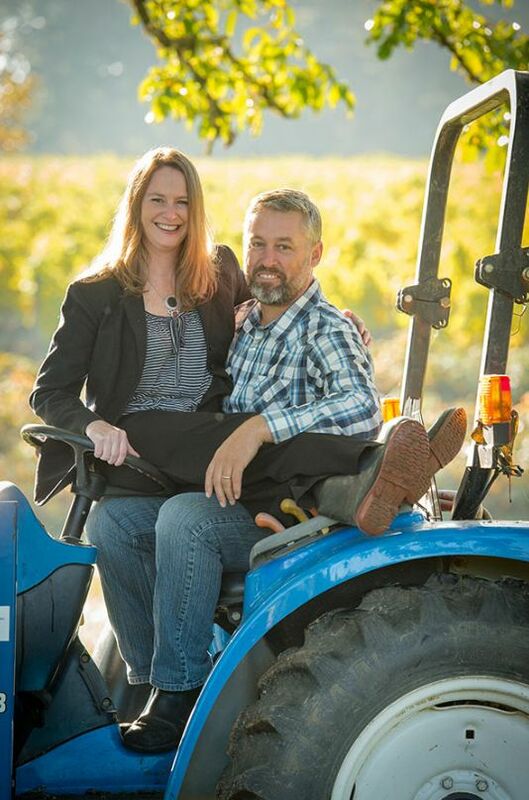 Scott and Lisa Neal established the Coeur de Terre Vineyard from 1999 to 2007 in the Coast Range foothills of the McMinnville appellation west of the town of McMinnville. Coeur de Terre, which is French for “Heart of the Earth,” was inspired by a large heart-shaped rock found during planting of the vineyard. The 50-acre property includes a winery, tasting room and 23 acres planted primarily to Pinot Noir in both sedimentary and volcanic soils. This is a winery to be admired for the Neals planted the vineyard themselves and have farmed the vineyard using organic and sustainable methods since its inception. Over 80,000 vines were hand grafted at the estate’s nursery and have been the parent material for all the vines after the initial Renelle’s Block planting. The clonal mix includes Dijon 115, 667, and 777, and Pommard, Wädenswil and field blend selections. 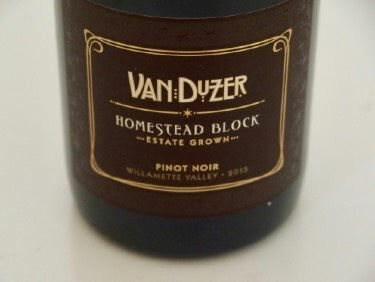 Scott’s focus is on Pinot Noir and produces a Willamette Valley Pinot Noir, and an Estate and four blockdesignated Estate Pinot Noirs from the home vineyard. Winemaking is traditional using small open-top fermenters, manual punch downs, using both indigenous and cultured yeast strains for fermentations. Aging is carried out in French oak barrels (about 40% for the Estate wines) for up to 18 months. The block-designated Pinot Noirs all have distinct character due to differences in soil type, clones, elevation, exposure, and age of vines. The wines are all vinified the same to bring out the unique character of each block. Pinot Gris, Riesling and a Rosé are also produced at attractive prices. Tasting is available at the winery in McMinnville daily from 11 am to 5 pm. Many enthusiasts belong to one of the three Wine Clubs and receive special pricing, access to limited release wines and invitation to club only events. Jacques Rendu has been the long-time sales manager and tasting room host. Visit the website at www.cdtvineyard.com. 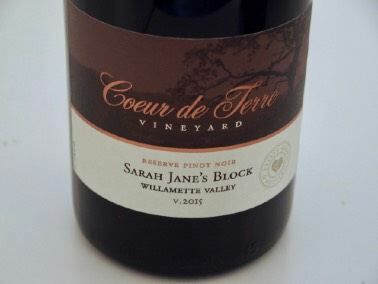 The 2015 vintage at Coeur de Terre was one of the hottest and driest on record, with warm days and cool nights. Bud break was early by about 2 weeks and the growing season preceded quickly. The warmth required the judicious use of irrigation, and combined with proper canopy management, harvest commenced at the end of September, early for this vineyard but only by 2 weeks. The 2015 Pinot Noirs are my favorites over the ten years I have been tasting wines from Coeur de Terre. Winemaking is experienced and impeccable and the wines truly reflect McMinnville terroir. The wines have an earthy, brambly quality, with supportive tannins. I find then akin to “Burgundy” but possessing more flamboyant fruit. All the wines are approachable now but have the balance and structure to age beautifully. Each of the block bottlings have subtle differences. Proprietors Neil and Sue Shay are Willamette Valley transplants from Florida who moved to Monroe, Oregon in 2010, purchased a property in 2011 and renovated a six-acre property that was overgrown with Christmas trees and populated with bluebirds. The couple had made hobby wines when living in Southern Michigan and had success in local wine competitions. Neil is a food science professor at Oregon State University and former director of the Oregon Wine Institute from 2010-2012. Sue had a background in sales and marketing and worked in that role for Airlie Winery and Heart of Willamette Valley wineries. She is the hostess at Bluebird Hill Farm B&B and Cellars. After spending three years to fully clear the land, the Shays planted 1.5-acres to Pommard clone Pinot Noir. More plantings have followed each year. Currently, the estate vineyard is 3-acres of high-density plantings including the addition of Wädenswil and Dijon clones. 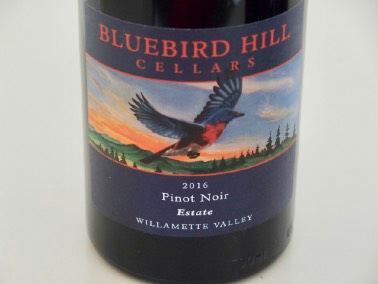 BlueBird Hill Cellars began small, with 214 cases from sourced grapes released from the 2015 vintage. The winemaker is Bobby Moy, a veteran who has crafted wines in Santa Barbara, San Luis Obispo and the Willamette Valley. Nick Cheatham, who has a degree in fermentation science from Oregon State University, is the assistant winemaker and vineyard manager. The winery expanded to seven varietals with the 2016 vintage. Local artist Sky Evans painted the bluebird that graces the attractive wine labels. A winery tasting room opened in 2016 and tasting is available by appointment and can be scheduled online. Visit www.bluebirdhillcellars.com to purchase wines. The Bluebird Hill Farm B&B, a private hilltop retreat, is available to rent at www.bluebirdhill.biz. Proprietor and winemaker Mike Hinds was born and raised in Oregon. Work in the music business and web development did not suit him, so after also working for four years in wine retail stores, he began crafting wine at Illahe Vineyards. His first commercial vintage was 2013. Grapes are sourced primarily from vineyards in the Willamette Valley, including Hanson, Zenith, Havlin and Zena Springs vineyards (all dry farmed). The wines are fermented with native yeasts, vinification proceeds without additives, and the wines are aged in used barrels and neutral tanks. The wines are made in small lots and sold primarily through a mailing list at www.francherewine.com. Tasting is available by appointment. The two wines here are from the Van Duzer Corridor AVA. Late afternoon winds are the most prominent feature of the AVA, cooling the region. The result is that the berries are small and thick-skinned and the phenolics ripen at slightly lower sugars compared to most of the Eola-Amity Hills. The unique block that the grapes are sourced from within the Havlin Vineyard consist of ironstone bedrock beneath marine sedimentary topsoil. The vines receive the proper amount of stress so the vines are naturally low yielding and do not require the dropping of fruit or leaf pulling. Master Sommelier Larry Stone was a legend in the restaurant business for many years, with stints at Four Seasons, Charlie Trotter’s and Rubicon restaurants. He was the first American to win the prestigious Best International Sommelier in French Wines competition in Paris. It seems everyone knew him, including Julia Child and Darrell Corti, and many invited him to lend his talents including André Tchelistcheff and the Coppolas. Despite his impressive resume and notoriety, Larry remains humble despite his remarkable palate and wine sense. Larry left the restaurant business in 2006, became president of Evening Land Vineyards in the Eola-Amity Hills a few years later, leaving in 2012. In 2013, he sold his vast personal wine collection and with the assistance of friends, family, and a major investor, David Honig, acquired a property in the Eola-Amity Hills AVA adjacent to Seven Springs Vineyard. 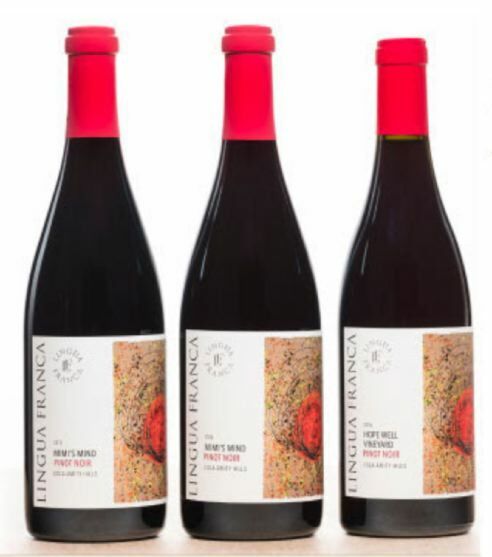 The inaugural Lingua Franca Pinot Noir and Chardonnay wines were produced in 2015 using purchased grapes, with estate-grown bottlings added in 2016 from the 66-acre LFV Estate Vineyard. A modern winery was constructed and completed in 2016. The wines are crafted in consultation with noted Burgundian vigneron Dominque Lafon and by on-site winemakers Thomas Savre and Larry Stone. The vineyard manager is Antoine Petigny-Samuelson. The wines are sold exclusively to mailing list and Wine Club members. Starting with the spring 2019 release of the 2017 vintage, a selection of very limited bottlings will be offered only to Wine Club members. Wine Club members also have exclusive access to the winery’s new Sommelier For Hire program. The Lingua Franca experience is made available to you in your preferred location. If you are not a member and would like to join or need more information about the winery’s Wine Club, inquire at hospitality@linguafranca.wine. Owner Eric Fullerton was first introduced to viticulture and winemaking as a 14-year-old boy in Boppard am Rhein, Germany in 1969. 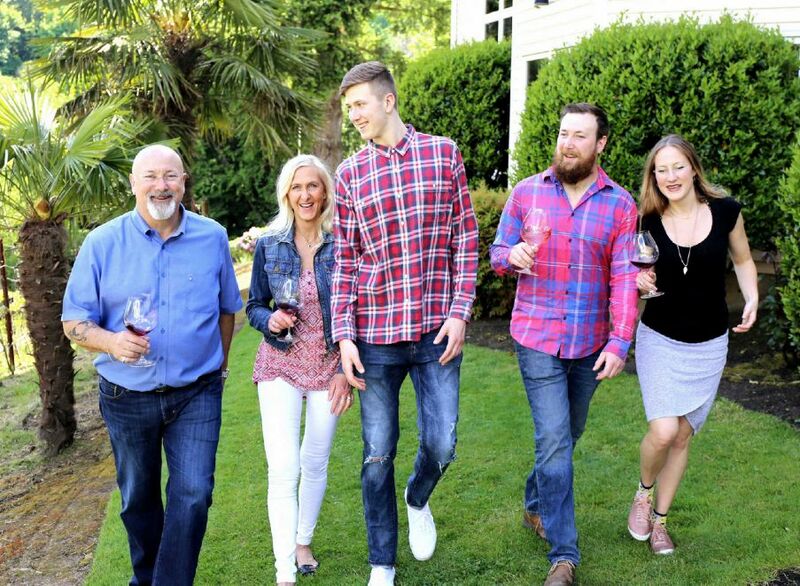 In 1997, the Fullerton family moved from Denmark to the Willamette Valley of Oregon where the wines proved inspirational to the Fullerton family. Eric’s son, Alex, who had swirled, smelled and tasted wine from a young age, had a serendipitous encounter with Lynn Penner-Ash that enabled Alex to begin his career in wine as a cellar hand for Penner-Ash Wine Cellars for two vintages. Alex and Eric made their first wine together in a garage in 2011. Alex worked a vintage for Josh Bergström of Bergström Wines in 2012 and the same year Fullerton Wines was launched with 350 cases of wine at the new SE Wine Collective. Today, Fullerton Wines produces 4,500 cases annually of Pinot Noir and Chardonnay sourced from select vineyard partners and the Estate Ivy Slope Vineyard. 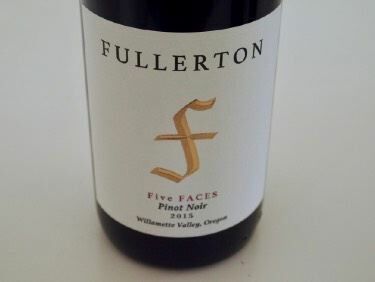 The winery has three labels: Fullerton single-vineyard designates of Pinot Noir and Chardonnay, Five FACES Pinot Noir and Chardonnay, and Three Otters Pinot Noir, Chardonnay and Pinot Noir Rosé. FACES is an acronym for the five Fullerton family members, Filip, Alex, Caroline, Eric and Susanne (see photo above), and resides on the Five FACES Willamette Valley bottlings. The Fullerton Coat of Arms hails from 13th century Scotland with three otters centrally displayed. These otters serve as the inspiration for the Three Otters label wines. Vinification is in open-top, closed-top and barrel fermenters, with punch downs for the open-top, pump-overs for the closed-top, and rotation for the barrels. Lots are usually cold soaked for up to 10 days and ambient yeast carry out the primary fermentation. Whole cluster inclusion varies with the lot and can change from 15% to 100%. Some vineyard-designated wine lots undergo extended maceration after fermentation. The vineyard designates are bottled unfined and unfiltered. 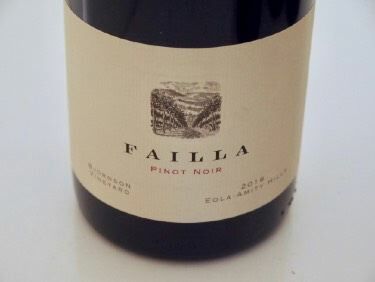 For more information and to shop for wines online, visit www.fullertonwines.com. The Fullerton Wine Bar and Tasting Room is located in Portland and is open Wednesday-Sunday. Nestled in the Van Duzer Corridor, the estate vineyard is impacted by oceanic influences, keeping the vines warmer during a cold growing season and cooler during a warm vintage (like 2015) compared to the rest of the Willamette Valley. The 2015 vintage was characterized by warm and dry weather. A dry, east wind at the end of August created the potential for dehydration in the vineyard, so a targeted watering program was instituted to combat moisture loss while allowing gradual maturation of fruit at an ideal measure of water stress. Fruit was harvested September 26. Visit the beautiful hospitality center for tasting open every day. the wines may also be purchased through the winery's online store at www.vanduzer.com. See previous issues of the PinotFile for the full scoop on this winery. Regular readers of the PinotFile know that I have a special attraction to Pinot Noir crafted with a significant amount of whole cluster. In winemaking, there are no universal approaches and this is what makes wine so interesting, so variable in its expression and so endearing. Proponents of whole cluster fermentation so relish the seductive, spicy, rose petal aromatics, the added flavors, and the soft, silky textures that they often pursue 100% whole cluster inclusion during vinification. Aromatics are the most challenging component of Pinot Noir to capture and whole cluster fermentation can achieve haunting aromatics. Not only that, but older Pinot Noirs made with a percentage of whole cluster can be more aromatically alive and complex. Whole cluster wines. although containing more tannin, tend to be softer than de-stemmed wines due to the increase in pH that stems produce and the contribution of partial carbonic maceration from whole berries. From a consumer perspective, some New World palates do not find Pinot Noir wines made with significant whole cluster inclusion to be appealing and prefer 100% de-stemmed wines. My counter-argument is many completely de-stemmed Pinot Noir wines taste the same. Opponents of whole cluster wines complain about the “veggie,” herbal, green tobacco, snap pea flavors that potentially can arise and be subtle or obvious. The downside from a chemical winemaking perspective, as pointed out by winemaker Ted Lemon, is that stem inclusion increases the pH and decreases the TA compared to a completely de-stemmed wine. “You may, depending on region, vintage and ripeness at picking, have to acidify the resulting wine unless you are comfortable with very high pHs.” (Ted Lemon uses a judicious percentage of whole cluster in his Pinot Noir wines). Finally, there is the question of terroir and whether stylistic practices mask it or reveal it. My advice is to line up some 100% whole cluster Pinot Noir wines from Kutch or RAEN or other producers with some 100% de-stemmed Pinot Noir wines, all from the same region and vintage, and taste them blindly. Decide for your self! Both Kutch and RAEN Pinot Noir wines are fermented whole cluster and aged in neutral (no new) oak. RAEN (“rain”) is translated to Research in Agriculture and Enology Naturally. Winemakers Carlo and Dante Mondavi give credit to their grandfather Robert and father Tim who were icons in the California wine business. Tim’s passion for Pinot Noir was translated into an inspiration for Carlo and Dante at an early age. The winery was launched with the 2013 vintage. The winery’s Pinot Noirs come from two estate vineyards in the Sonoma Coast and an unnamed 10-acre vineyard deemed “Sonoma Coast.”. 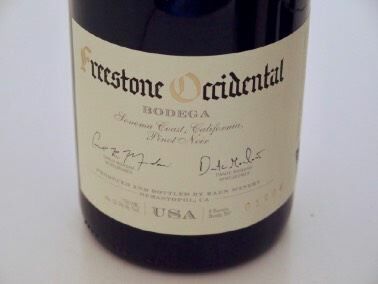 Freestone Occidental Bodega is the coolest daytime site. Situated at 750 feet elevation, clones 667, Calera and Pommard are planted in Goldridge sandy loam. The Fort Ross-Seaview Home Field Vineyard overlooks the Pacific Ocean north of Jenner. Grapes struggle here to ripen during the growing season. Clone 777 is planted at an elevation of 1,025-1,270 feet. Soils are well-drained iron-rich sandstone of the Franciscan series. All of the 2017 grapes were picked, fermented and put into barrel before the tragic fires that swept through Sonoma, Napa and Mendocino. RAEN vineyards remained untouched. 2017 was an ideal growing season on the Sonoma Coast. Stormy winter rains replenished the soils, streams and lakes of California, ending five years of drought. The rains gave way to a beautiful spring and bud break returned to a more historical norm. This was followed by a cool, even growing season until mid-August when a series of heat waves arrived. These heat waves moved the final stages of ripening along rapidly. Overall, yields at RAEN were slightly lower than historical averages. The vintners recommend cellaring the wines for two years or if opened now, decant or open one hour prior to pouring. RAEN Pinot Noir is available through a mailing list and the RAEN Society Wine Club programs. Tasting is by appointment. A Fort Ross-Seaview Chardonnay from the 35-year-old Charles Ranch is also available. Visit www.raenwinery.com. I have written extensively in The PinotFile about the wines of Jamie Kutch. The wines have been on my annual All-American team several years including 2018. 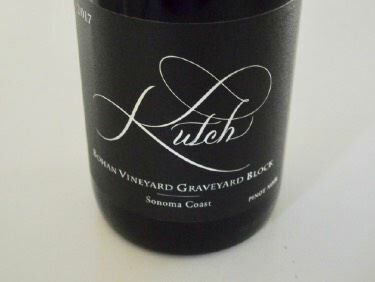 Kutch Wines was one of my 2017 Wineries of the Year: www.princeofpinot.com/article/2024/. 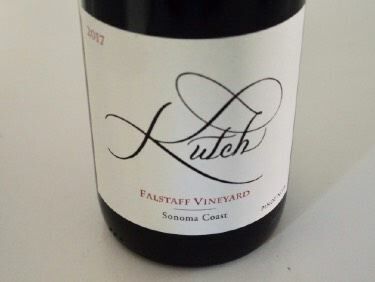 The small production is sold through allocation to a mailing list at www.kutchwines.com. Micah Joseph Wirth and Adrain Jewel Manspeaker pooled their middle names to found this winery beginning with the first commercial vintage in 2007. Micah grew up in Alexander Valley and learned winemaking under the direction of his winemaker father and was mentored at Gary Farrell Winery by winemaker Susan Reed. Adrian was raised in Humboldt County, studied winemaking and viticulture at UC Davis extension program. and learned his practical skills at C. Donatiello Winery and Peay Vineyards. The winery features Pinot Noir and Chardonnay sourced from stellar vineyards in Humboldt County and Sonoma County. The “home” vineyard is the Starscape Vineyard (formerly known as Floodgate Vineyard), just down the road from the winery’s tasting room in Forestville. The vineyard enjoys close company with legendary vineyards such as Kistler and Ritchie. Located at the crook where the Russian River turns west towards the Pacific Ocean, this special spot benefits from the coastal fog that provides cooler evening and early morning temperatures shaping the vibrant acidity the vineyard exhibits. Thirteen different clones of Pinot Noir and five clones of Chardonnay are planted. Joseph Jewell has worked with this vineyard since 2008. A tasting room offering several tasting options and experiences is open Thursday-Monday in Forestville. 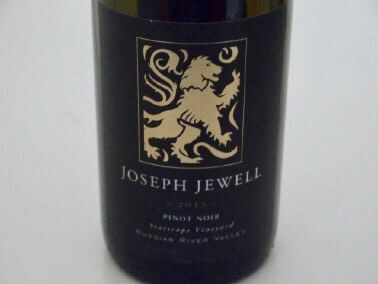 The winery’s Pinot Noir and Chardonnay are sold on the website at www.josephjewell.com. I have been reviewing Joseph Jewell wines since the 2009 vintage and the following are among the best wines I have tasted from this winery. They are highly recommended. Proprietor Dr Kirk Neely offers Pinot Noir and Chardonnay from the Spring Ridge Vineyard. The vineyard is situated within a large parcel owned by Kirk and his spouse Holly Myers at the northern boundary of the Santa Cruz Mountains. 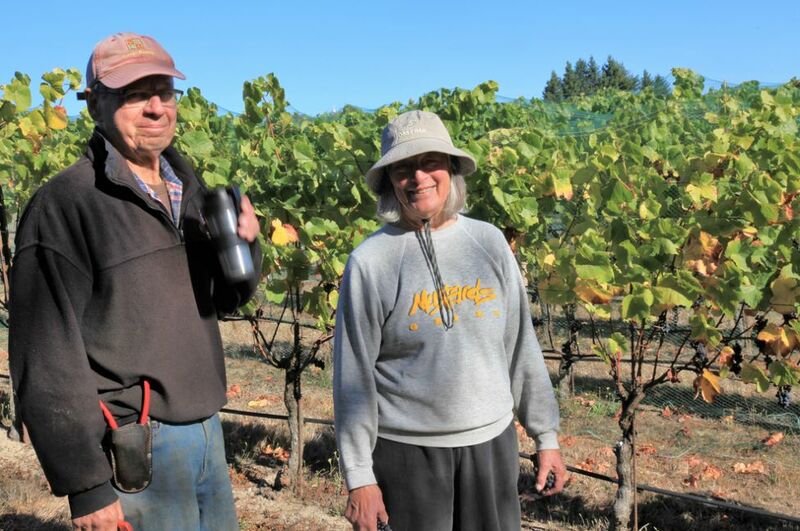 Jim and Bob Varner began planting the Spring Ridge Vineyard in 1980. They started with Chardonnay and Gewürztraminer, adding 7 acres of Pinot Noir clones 115 and 777 in 1997 and grafted over the Gewürztraminer to Pinot Noir clone 777 in 2006. Bob became the winemaker for Varner Estate and Foxglove wines as well as Neely wines. Jim took over sales and marketing of the wines. Bob retired in 2015 and Shalini Sekhar became the winemaker. She has an impressive background, having worked at Stag’s Leap Wine Cellars, Williams Selyem, Copain Custom Crush, Bluxome Street Winery, ROAR and made wines for Furthermore and Waits-Mast. In 2015, she was named Winemaker of the Year at the San Francisco International Wine Competition for her work with Furthermore. The small bi-level indoor-outdoor winery and cellar located on the property was completed in 2000. Because the vineyard and winery are located in a Preserve in Portola Valley, the winery cannot have a tasting room, accept visitors, or conduct events, and thus remains largely hidden from the public eye. That said, the wines have received considerable notoriety. Several distinct blocks have been identified: Hidden Block and Picnic Block for Pinot Noir and Home Block, Amphitheater Block and Bee Block for Chardonnay. A new phase of vineyard planting has begun. The Neely wines are available on the winery website at www.neelywine.com. Three subscription wine club formats are also available. A micro-negociant based in Salinas that is focused on some of the coolest and most compelling terroirs of the Central Coast. Coastal mountainous sites and organic winegrowing are the tenets of the brand. Established in 2014, Samuel Louis Smith original focused on the Sta. Rita Hills Pinot Noir, but the brand has shift its focus to Sta. Rita Hills Chardonnay, Monterey Pinot Noir and Santa Cruz Mountains Syrah. Samuel trained with stints under Doug Margerum in Santa Barbara and Francois Villard in the Northern Rhône and is now the head winemaker at Morgan Winery. Samuel Louis Smith winery produces about 400 cases annually. Visit www.samuellouiswines.com to join the mailing list to acquire the wines. 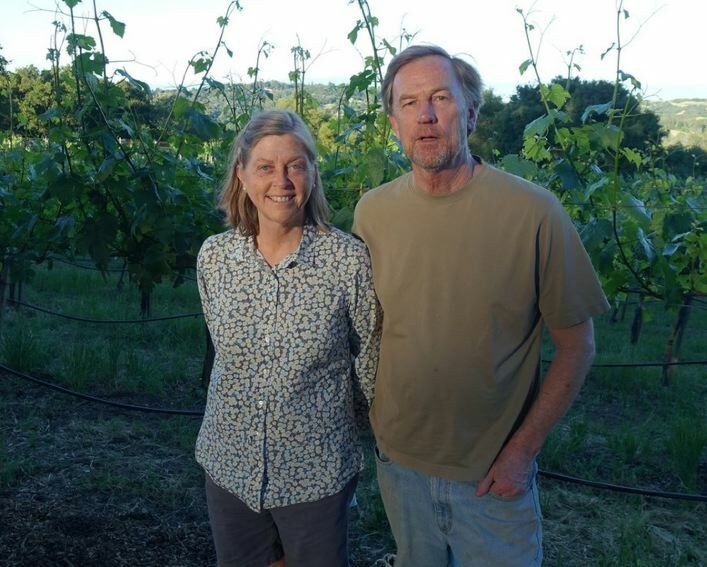 Winemaker Bobby Donnell and his viticulturist spouse Shannon Donnell produce small amounts of Russian River Valley Pinot Noir, Pinot Noir Rosé and Chardonnay. The first vintage was 2012. Four of their Pinot Noir wines since 2013 have scored 94 or above in the PinotFile. 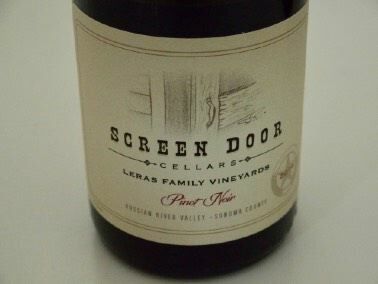 The wines are sold on the website at www.screendoorcellars.com. Sojourn is a highly acclaimed winery specializing in Pinot Noir, Chardonnay and Cabernet Sauvignon. Fruit is sourced from vineyards in both Sonoma and Napa counties. Winemaker Erich Bradley directs farming operations and crafts the wines along with associate winemaker Randy Bennett. I have reviewed vintages dating back to 2008, and always found the wines consistently excellent. The 2017 vintage endured tragic wildfires on October 8-9. All of Sojourn’s Chardonnay and Pinot Noir grapes were picked prior to the fires so there was no impact on the wines. The Sojourn Pinot Noirs in this vintage are all forward-drinking but lack the concentration of the previous two vintages. The winery’s Tasting Salon is open by appointment in downtown Sonoma. Visit www.sojourncellars.com. Three Sticks is a boutique, family-owned winery led by Director of Winemaking, Bob Cabral known for his previous success at Williams Selyem. Founded in 2002, the winery is named for owner William S. Price III’s surfing nickname. “Billy Three Sticks” as a name given to him in his youth as reference to the Roman numerals that follow his name. Three Sticks is part of the Price Family Vineyards & Estates (PFVE), a portfolio of premium vineyards and wineries owned by Bill Price - www.pfve.com. Winemakers Ryan Prichard and Ashley Holland work closely with Bob Cabral in crafting the Three Sticks wines. 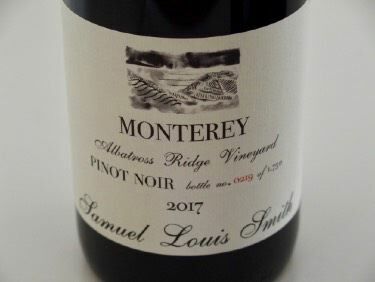 The 2016 vintage Pinots reviewed are are very similar in style, with well-ripened fruit and a generous oak imprint, but vineyard differences still show through. The Prices purchased the historic Vallejo-Casteñada Adobe (built in 1842) in the town of Sonoma and embarked on a two-year preservation project. The historic landmark is now home to the hospitality of Three Sticks. Tasting is by appointment: concierge@threestickswines.com. 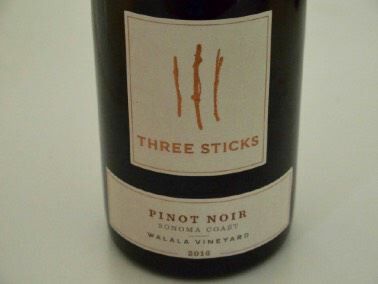 The Three Sticks portfolio consists of Appellation Pinot Noir and Chardonnay, Single-Vineyard Designated Pinot Noir and Chardonnay, Cuvée Selections, and Adobe Selections (more reasonable wines for visitors to the Adobe). 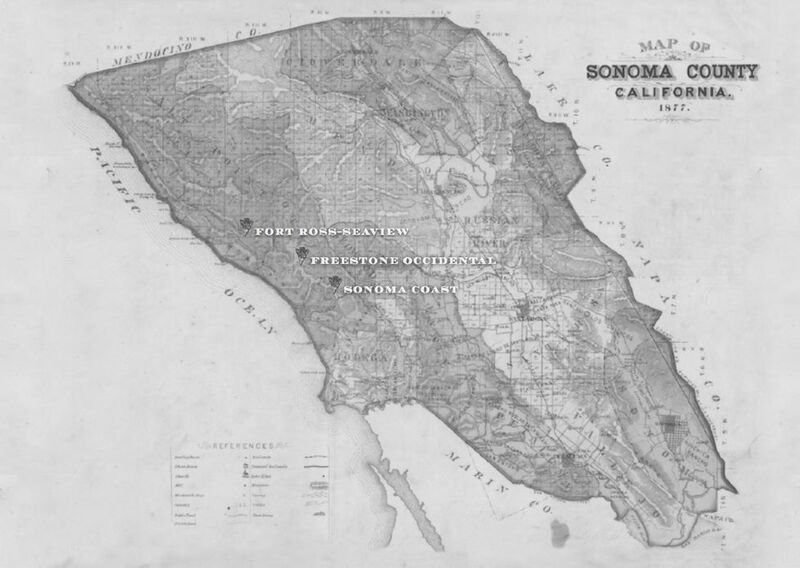 Grapes are sourced from the Sonoma Coast, Sonoma Mountain, Russian River Valley and Sonoma Valley appellations. Estate vineyards include Durell, Gap’s Crown, Walala, Alana and William James. The wines are available via personal allocations and through distribution to select restaurants and fine wine shops in 22 states. Visit www.threestickswines.com. Some large formats are available. Sextant Wines Acquires Old Edna Township I have not visited Old Edna since 2006 when my wife and I spent two nights at the Suite Edna B&B operated by Pattea Torrence who had owned the Edna Valley property since 2002. This lovingly restored farmhouse dates to 1908. The original stagecoach road that linked San Luis Obispo and Pismo Beach runs through the property. I read today that Sextant Wines and proprietors Nancy and Craig Stoller arrived in Edna Valley in 2009 and operated a tasting room here. The Stollers had purchased the adjacent vineyard in 2007. They were able to acquire the entire Old Edna Township on January 7, 2019, and plan to preserve and renovate the property. They want to have people visit the property and stay in one of the guest houses on the property. Visit www.sextantwines.com or www.oldedna.com. Moshin Vineyards Celebrates 30th Anniversary in the Russian River Valley Moshin Winery has been led by winemaker Rick Moshin since 1989. The winery will celebrate this milestone with a year’s worth of events at its Westside Road estate. The winery is participating for the first time in the World of Pinot Noir and the International Pinot Noir Celebration as well as Healdsburg’s Pigs & Pinot. On the last Sunday night of each month in 2019, Moshin’s tasting room will host open-house receptions with some dates introducing the latest works of local Sonoma County artists. Moshin Vineyards specializes in single-vineyard and estate-blended Russian River Valley Pinot Noir, but also produces Chardonnay, Sauvignon blanc, Merlot and Zinfandel. Visit www.moshinvineyards.com. Amcor’s EASYPEEL Capsule A new capsule design uses a one-piece aluminum capsule engineered to open wine bottles along a clean line every time. 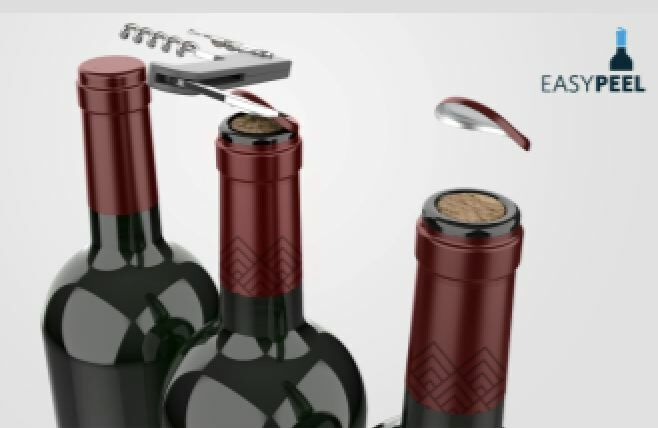 Users place a knife from an opener at a point indicated on the capsule and peel back to create a clean and consistent opening. The result is aesthetically pleasing. Pinot Noir Prices Tops At the North Bay Business Wine Industry Conference in 2018, it was reported that In Sonoma County, the wine grape variety Pinot Noir continues to drive the bus, with an average grape price of about $4,000 per ton. Amalie Robert Estate Winery in the Willamette Valley 2018 Harvest Update Ernie Pink gives a detailed summary and a humorous up-close look at harvest and the 2018 vintage in his Amalie Robert Estate Farming Blog, aka FLOG, at www.amalierobert.blogspot.com. 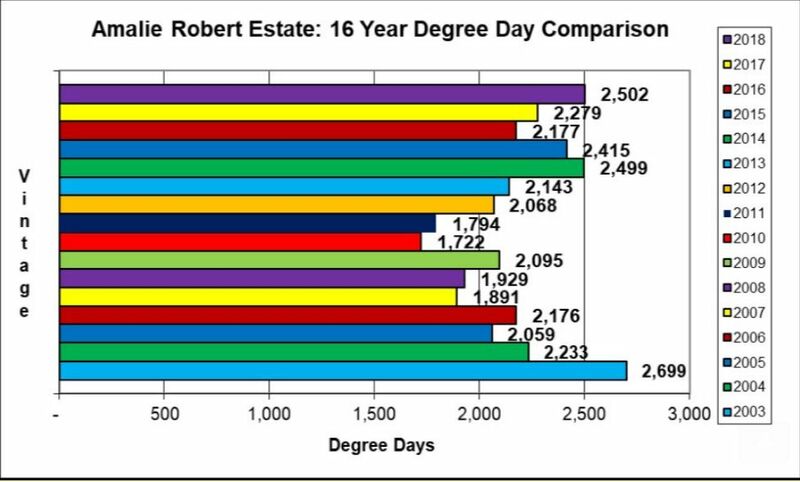 As you can see by the 16-Year Degree Day Comparison, 2018 was as Ernie says, “Dry, dry, dry as a popcorn flatulent.” Not since the 2003 vintage (2,699 degree days) and the 2014 vintage (2,499 degree days) has the growing season been so intolerable. Oregon 2017 Wine Industry Census The Oregon Wine Board released its Oregon Vineyard and Winery Report in September of 2018. 2017 saw an increase of 44 wineries and an increase in vineyards from 1,144 in 2016 to 1,052 in 2017. The North Willamette Valley still leads with 637 vineyards, 19,705 acres planted, and 491 wineries. Production in tons for Pinot Noir in 2017 was 53,457, an increase of 16.6% with Pinot Gris second (13,786 tons, an increase of 1.4%) and Chardonnay third (an increase of 33.3% to 5,812 tons). Export sales were led by Canada (49 percent of exported Oregon wine) and the UK, with increasing exportation to Japan. Greg Jones Interview at SipNorthwest.com Greg Jones, a climatologist and director of the Evenstad Center for Wine Education at Linfield College was interviewed recently at www.sipnorthwest.com/ greg-jones-climate-change-wine/. He pointed out that water availability is a growing issue in many regions. Heat stress is also concerning especially during fruit ripening. Another concern is the movement of diseased plant material into regions where the climate is now more conducive to spread. He described some interesting research to trick the vine to ripen fruit later by removing the majority of leaves before flowering. This has the potential to delay ripening into a cooler period of the summer. The Prince Now on TastingBook.com TastingBook is the world’s largest wine information source. There are over 11,000 wine professionals presented in TastingBook. tastingbook.com had over 55 million page views since 2016! Visit my Pro-page and tasting notes at www.tastingbook.com/pro/prince_pinot. 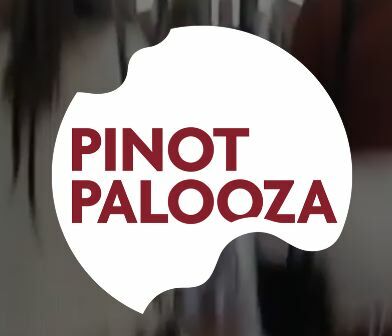 Pinot Palooza This consists of daylong events held in eight cities across Australia and New Zealand plus Hong Kong, Tokyo and Singapore and is considered the world’s largest Pinot Noir festival. The touring event features a tasting of Pinot Noir from local producers as well as ones from New Zealand, America, France and Italy. In 2019, it will be held in May-December. Visit www.pinotpalooza.com.au. DTC Sales of Wine Hits New Record The winebusiness.com reported that in 2018, consumers spent $3 billion on DTC wine shipments reflecting a 12% annual growth. Over 6 million cases of wine were shipped in 2018, reflecting a 9% annual growth. The top winery regions by volume growth were Sonoma, Oregon and Washington. Sonoma County has overtaken Napa County with the most wine shipped by volume. 10% of off-premise retail wine is shipped direct to consumers. Total U.S. Wine Market Tops $70 Billion According to the Wine Analytics Report, January 2019, the total U.S. wine market came to 408 million cases and has doubled in value since 2003. Of the 408 million total cases sold in 2018, a little more than 331 million were sold off-premises and 77 million were sold on-premise. Imports account for 26% of the total cases by volume and 33% of the market’s total value. The trend of premiumization continued through 2018 and is expected to carry on through 2019. 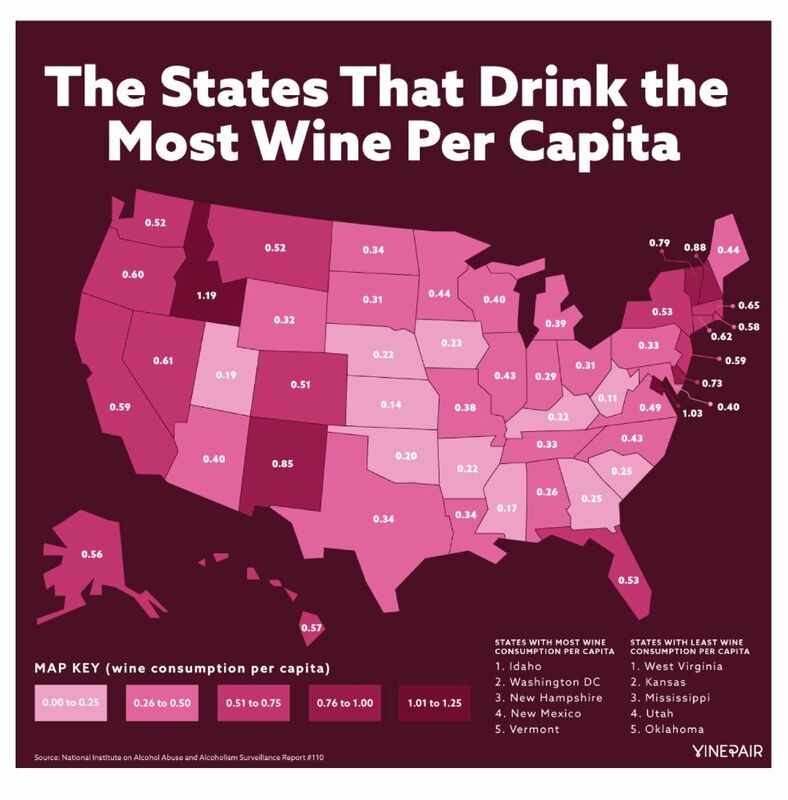 States That Drink the Most Wine States with the most wine consumption per capita include Idaho, Washington D.C., New Hampshire, New Mexico and Vermont. Source: National Institute on Alcohol Abuse and Alcoholism. State of the Industry Report 2019 Silicon Valley Bank recently published its 2019 outlook. 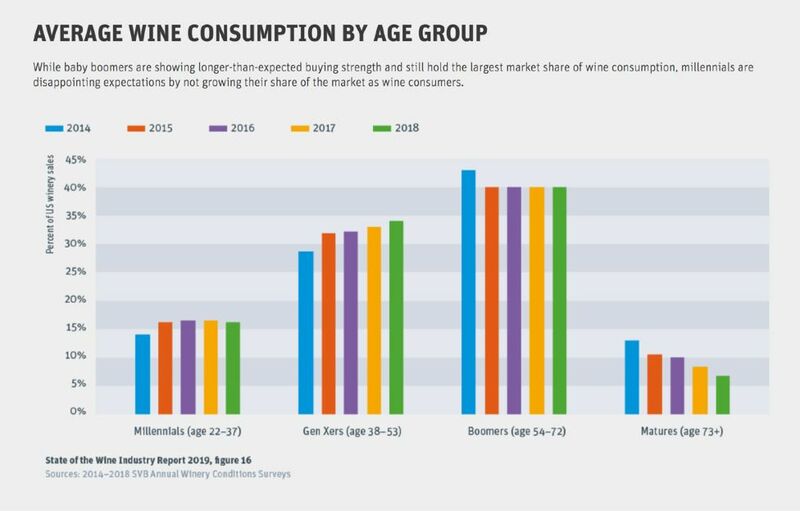 Forecasts included: (1) Millennials are not embracing wine consumption as many had predicted due at least in part to cannabis legalization and a cumulative negative health message surrounding alcohol (see charts below); (2) Baby boomers still lead in total wine purchases but are declining in numbers and per capita consumption; (3) Both volume and dollar sales are expected to end lower than 2018 and growth of the premium wine segment will be roughly flat from the 2018 sales growth estimate; (4) Bottled imports will take additional market share from U.S. producers; (5) overall retail pricing should be flat for premium wine; (6) Oregon will be the bright spot regionally as consumers continue to find good value in the region’s offerings. Visit www.svb.com/wine-report/ for the full report. On a related note, Dan Leese, co-founder and CEO of V2 Wine Group, spoke out about the increasing challenge for smaller producers to bring wines to consumers. The top nine suppliers have an almost 70 percent share of the U.S. wine volume. Meanwhile, there has been an explosion in wineries across the U.S. from 1,800 in 1985 to 9,872 in 2015. Chef Dustin Valette to Open Two New Healdsburg Restaurants According to sonomamag.com, Valette and business partner and brother Aaron Garzini and tech executive Craig Ramsey are to open The Matheson (main floor 98-seat restaurant) and Roof 106 (an al fresco rooftop restaurant), a two-restaurant project on the Healdsburg Plaza. Visit www.thematheson.com. Upcoming Events of Interest: San Francisco Chronicle Wine Competition Public Tasting, February 16, 2019, Fort Mason, San Francisco, advance tickets $70, www.winejudging.com. Anderson Valley White Wine Festival, February 23-24, 2019, Saturday Winemaker Dinners and Saturday and Sunday Winery Open Houses, www.avwines.com/white-wine-festival. 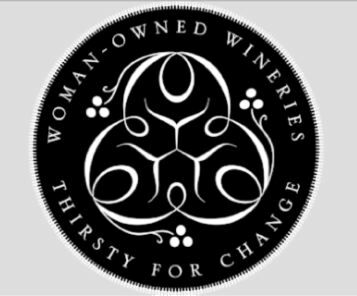 Here’s to Her, a feast and fete for women-owned wineries, February 12, 2019, Suite D, 21800 Schellville Rd, Sonoma, tickets $95-$350 at www.eventbrite.com. World of Pinot Noir, Bacara Resort, Santa Barbara, March 1-2, 2019, www.worldofpinotnoir.com. Sonoma Barrel Tasting 2019, March 1-3, 8-10, www.wineroad.com. La Paulée de New York, March 5-10, 2019, New York City, Burgundy growers, collectors and aficionados gather for a week of dinners, tastings and talks, capped by a massive BTOB fête fashioned after the annual La Paulée de Meursault in France, www.lapaulee.com.